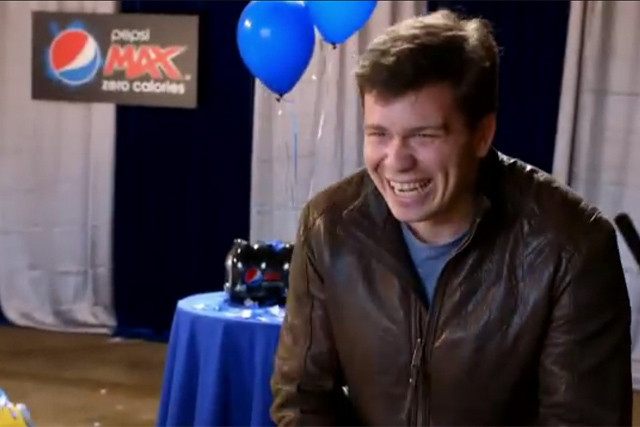 Pepsi Max and NASCAR driver Jeff Gordon scored a mammoth social video hit last year with its hilarious "Test Drive" ad. The commercial, which saw a heavily-disguised Gordon take a supposedly unsuspecting car salesman on the test drive from Hell, was one of the biggest video campaigns of the year, attracting 2.72m shares...and counting. But not everyone was a fan. Like Travis Okulski from auto blog Jalopnik, who wrote several scathing articles explaining why the ad was a complete fake. However, Gordon and Pepsi were not prepared to take Travis’ criticism lying down. So when they were coming up with potential victims for the sequel, there was only really one name in the frame. With some help from his 'friends' and colleagues, Travis was lured him to Charlotte, North Carolina, ostensibly to get a sneak peek at the new Corvette. But when he gets in the taxi to take him to his test drive, he soon finds himself in the middle of a white knuckle police chase. Suffice to say, he isn’t crying fake this time around. The ad has a long way to go to match the success of the original, but has already raced out of the blocks, attracting more than half a million shares and 13.3m views in less than a week. Not bad for a sequel. But then, "Test Drive 2" is not your average follow-up campaign. Although it didn’t seem possible before watching this ad, Travis’s reaction is even funnier than the car salesman in the first video – a huge driver of online shares. Like the original, it’s also very exhilarating, although this is largely down to Travis’ antics rather than the driving. At one point he even tries to smash the dividing glass in the taxi with his feet, his face contorted in fear and confusion. What makes it even more interesting is that he still manages to be polite throughout, imploring the runaway taxi driver with lots of ‘pleases’ and ‘sirs’. But, of course, the big question is, will it outperform the original? Well, certainly, it’s well worth a watch, but, of course, we’ve been down this road before with Jeff Gordon and Pepsi Max. We already know the prank well and know what to expect before we even click play. And that is the main reason why "Test Drive 2" will probably fail to do better than the original. Certainly, the signs are already there. When you compare the two ads’ performances during the first few days, there is certainly a stark difference in the number of shares they attracted. In just six days, "Test Drive 2" has managed 536,416 shares, which is pretty impressive. But not when you compare it to "Test Drive’s" performance at the same point, which was 2.25m shares. So although a very good ad in its own right, like so many sequels, it looks destined to sit in the shadows of the original.